Ever since his first rave experience in the hay day of San Francisco's underground scene at the "Haze Theater" in 1993, Sean Rojas (a.k.a. djinfinitee, Infinitee, Sean Infinitee) has been moved by the music, the vibe, and the emotional journey a DJ can take you on. Inspired early on by synthesized sounds from artists like Kraftwerk, Afrika Bambaata, Grand Master Flash, and Herbie Hancock during the break-dance revolution, Sean has held a deep appreciation for electronic music since his early youth.After becoming a regular at events within the San Francisco rave scene, Sean became more and more interested in what was going on behind the decks. Influenced heavily by the sounds of local San Francisco legends Jeno, DJ Dan, Garth, Carlos and Dutch, Sean and three of his best friends Jeremy Weintraub, Gabe Sventek, and Dave White put their funds together and got a pair of decks and mixer. 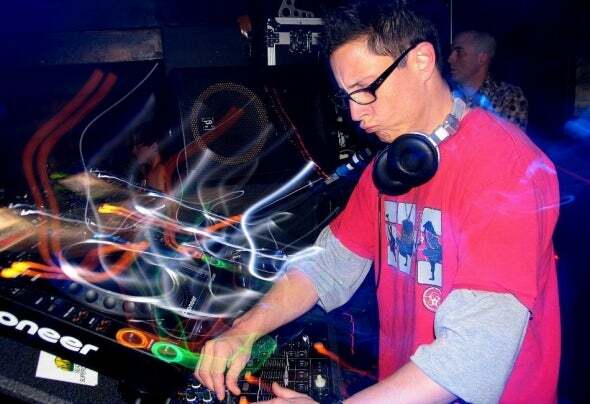 Fueled by his passion for the music, he took advantage of any opportunity to spin-getting his feet wet at local house parties within the SF Bay Area from early 1993 through early 1995- playing everything from House, to Breaks, and early Techno. Honing his skills and expanding his horizons, Sean's DJ influences began to branch outward towards the East Coast where heavy hitters like Danny Tenaglia, Junior Vasquez, Josh Wink, and Little Louie Vega reined supreme. After 2 years of bedroom DJing and playing house parties, Sean was ready for prime time. In February of 1995, he made his official debut when he and his three friends threw their first party called "Ravers in Wonderland” playing along side the very same artists who inspired him in the very beginning. Fast forwarding almost 14 years, Sean eventually found his niche playing Nu-Skool breakbeat, and achieved his career defining moment when he won the Breaks FM International DJ Competition in 2003 winning the a slot to play along side the likes of; Public Enemy, Orbital, Jay Cunning, Atomic Hooligan, The Autobots, Deekline, Skool of Thought, The Lawgiverz, and more at the “Esparrago Rock Festival” in Spain. After proving his worth on the decks, he was offered a spot on the renowned internet radio station, and became the first U.S. breaks DJ to host a weekly show on Breaks FM. His 3 Turntable live show "Thee Tilt! Sessions" became known as one of Breaks FM's premier shows, running 2 hours weekly 3 years in a row with past live guestsincluding The Autobots, NAPT, The Carbon Community, Fine Cut Bodies, Influenza, High Eight, Cause ‘N FX, Kraddy, and more.While not only working hard at pushin' breaks via the internet airwaves, Sean played an integral part at building the breakbeat scene within NYC. He partnered with local D'n'B crew Direct Drive and local up and coming DJ Wavewhore to produce NYC's longest successful breaks weeklies “Hit the Breaks” and “Unbreakable” at the Sullivan Room. Holding a residency at Sullivan Room from 2004- 2006, he is credited with bringing artists for their first US appearances like NAPT, Autobots, Kid Kenobi, DJ Quest, Atomic Hooligan, Jay Cunning, Baobinga, etc., and was in demand as NYC's top breaks DJ going on to rock venues throughout the Northeast including DC, Boston, Philly, Upstate NY, and more.In 2009, Sean relocated back to the Bay Area where it all started, and began producing his event "Wicked Wednesdays" at Lounge 3411 (Oakland), and Shine (SF) where he held residencies 2009-2011, and connected with the Burning Man camp, "Opulent Temple," earning a slot to play in 2009 and '10 on the renowned Opulent Temple stage on same dance card as Elite Force, Bunny RITM, Seb Fontaine, and more.In 2011 and '12 Sean turned his focus away from producing/DJing events and into the studio. Working hard on his forthcoming album "To Infinitee & Beyond" to be released later this year on his new digital label "HyperKat- Recordings" as well as Classic Rock/80's remixes for his label "iRock-Classics," he has built a solid repertoire of music.Armed and ready with his new tracks and fueled up by the controversy over the influx of laptop and sync button dependent new DJs, Sean's passion for his art has been re-ignited, and has been working tirelessly to develop a new DJ community website dedicated to preserving the true art form and demand for real Disc-Jockeys called the "Defenders Of Turntablism" (www.defendersofturntablism.org).Look out for more from Sean including exclusive Beatport releases in '14 and beyond! Raiders of the Lost Break E.P.